Vikku ji started the group named “Vikku's 3G” with V.Selvaganesh and S. Swaminathan, where 3 generations (grandfather , father and son) playing together in stage. “3G” gave its first performance at “Idea Jalsa” an initiative by Durga Jasraj and followed by various successful performances. Vinayakram's concert career began at the age of 13. His first performance occurred on 5 March 1957 at the Rama Navami festival in Thoothukudi. While proceeding for the arangetramthe tuned ghatam instrument was broken by a child named Ganesh, which by itself had been a good omen for his bright career. where he accompanied V.V.Sadagopan. He was soon accompanying many famous vocalists in Carnatic music at the time, including Chembai Vaidyanatha Bhagavatar, M K Thiagaraja Bagavathar, Dr Sirkazhi S.Govindarajan, Mangalampalli Balamuralikrishna, G. N. Balasubramaniam, Madurai Mani Iyer, Semmangudi Srinivasa Iyer, M. S. Subbulakshmi and Maharajapuram Santhanam, among others. Vinayakram's tryst with the international music platform came in the early 1970s when he joined Shakti to play along with John McLaughlin and Zakir Hussain. Vinayakram is Principal of Sri Jaya Ganesh Tala Vadya Vidyalaya in Chennai, India – the academy established by his late father and teacher in 1958. It continues to produce new stars of Carnatic percussion. Vinayakram was conferred the Hafiz Ali Khan Award for "unmatched contribution in the field of music" in 2000. He is also the first South Indian musician to be awarded the Grammy for Best World Music Album for his participation in Mickey Hart's Planet Drum, in which he played ghatam and morsing. He donated all the proceeds from the award to a charity organisation in south India. He was also nominated for the 1996 Grammy Awards for Best World Music Album for his participation in 'Raga Aberi' along with L. Shankar on the ten string double violin and Zakir Hussainon the tabla (the piece is set in the tala cycle of 4¾ beats). The Indian Government decorated him with the Padma Shri Award in 2002. Finally, he was awarded the 2012 Sangeet Natak Akademi Fellowship (Akademi Ratna), the highest award in performing arts in India, given by Sangeet Natak Akademi, India's National Academy for Music, Dance and Drama. In 2014 he was awarded the Padma Bhushan by Government of India Vinayakram, was awarded Bharatharatna, Dr.M.S.Subbulakshmi Centenary award,on 16th,Sept,2016. V Selvaganesh was born in Chennai to Grammy -winner T.H.Vikku Vinayakram, a legendary musician and also a former member of the original Shakti. He is also thegrandson of Sri T. R. Harihara Sarma , who founded the Sri Jaya Ganesh Tala VadyaVidyalaya (Sri JGTV school) in Chennai . Selvaganesh had his initial training at his grandfather's school and then under his uncle, Ghatam Vidwan Shri T H Subashchandran. one of the leading musicians in the world of rhythm. Thumping into the musical world at an age as tender as 10 , Selvaganesh has been mesmerizing the audience with his immaculate style and innate creativity. Selvaganesh is one of the leading musicians in the world of rhythm. 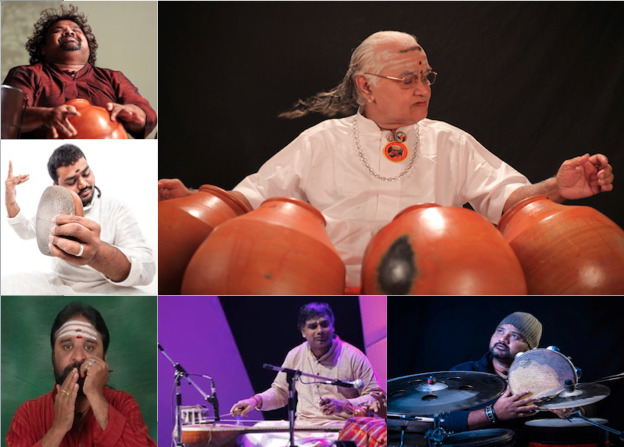 Selvaganesh’s tryst with the international music platform came in the early 90s in Masters of Percussion along with his Zakir’s father Ustad Alla Rakha And when he joined Shakti to play along with John McLaughlin and Zakir Hussain . Swaminathan Selvaganesh grandson of Padhmasri T.H.vinayakram and son of V.Selvaganesh, born on 25th april 1993. Being born in a family devoted to traditional music, Swaminathan started learning kanjeera when he was 4years old under the guidence of his grandfather and father. He gave his first performance in a concert at the age of 13 accompaning his grandfather. to showcase their expertise . His father Shri V Selvaganesh and Swaminathan started doing duo concerts and the very first performance with both of them together was held at Goa festival of music in “KALA ACADAMEY” which was followed by several musical tours in india. Ghibran. Swaminathan had a opportunity to share stage with legends like pandit hariprasad chaurasia pandit Jasraj , Shri Balamurali krishna, ustad zakir hussain and many leading artists. A Ganesan, a gifted Morsing player has established his own style of playing with the instrument and has won accolades for his dexterity and dynamism. He started learning Morsing from Late T R Harihara Sarma (vikkuji,s father ) and later on from Vikku Vinayakram . He has been awarded “Asthana Vidwan“of "Kanchi Kamakoti Mutt"
N.Rajaraman has traveled widely and performed in various prestigious halls such as Queen Elizabeth, The Royal Festival Hall in London, the Lincoln Centre in New York and has participated various Indian musical festivals in abroad. He has been awarded by UNESCO for participating in the millennium festival in Bali. Awarded as “Performer Award” for the year 1998 from Shri Krishna Gana Sabha, Chennai. Received the title of “Vadhyakala Vipance” from Dr.Balamurali Krishna’s Trust in December 2008 and “Kanchi Kamakoti Asthana Vidwan” from Kanchi Mutt on September 2010. He also participated in Woodford Arts festival 2011 in Brisbane. Ghatam Vidwan V Umashankar comes from a lineage of highly accomplished musicians. He is grandson of Shri T R Harihara Sharma and the second son of Ghatam Maestro T H Vikku Vinayakram, First South Indian Grammy Awardee. Shri Harihara Sharma founded the Shri Jayaganesh Tala Vadya Vidhyalaya where Umashankar began giving performances as early as when he was 5 years old along with other students of the School. He is the only one, amongst his siblings, to follow in his Illustrious father’s footsteps by taking Ghatam as his main instrument. His meteoric rise in the Classical Carnatic music field began with his first concert for Legend Shri T V Gopalakrishnan’s vocal concert in Kanchipuram when he was only 12 years old. Following which he was a regular accompaniment to various upcoming artists of those days namely T M Krishna,Vijay Siva, Sanjay Subramaniam, Unni Krishnan, Ganesh Kumaresh, Nithyashree Mahadevan, Priya Sisters, Sudha Raghunathan et al. toured extensively. As a reward to his hardwork he was invited by Bharatha Ratna M S Subbulakshmi Amma to accompany her for one concert. This opportunity meant a lot to him as he was filling in place of his peerless father who used to be MS amma’s first choice Ghatam accompaniment as always. Legends Balamurali Krishna, Mandolin U.Shrinivas, Yesudas soon followed with their invitations to accompany them. Along with these invitations came opportunities to travel abroad with many of the stalwarts. He has travelled extensively and enchanted audience world over. His approach in accompanying South Indian Classical Carnatic music was much appreciated by Artists of Hindustani Style which created opportunities for him to accompany Ustad Amjad Ali Khan, Zakir Hussain, Pandit Jasraj, Hariprasad Chaurasia, Shivkumar Sharma. Jazz and Alternative Music Artists such as Jonas Elberg, Ricky Ray, Alexandra Romanova. He is also participated in A R Rahman’s project titled Desh Kaa Salaam , in which he accompanies his legendary father along with many legends.